The day where we’re all trying to slow down while also keeping up with our responsibilities and ambitions and dreams and all the things that we maybe got behind on this weekend, and, just, bottom line, trying to get our lives together and be mostly happy. Amiright? Ahh, life. I’m glad to be living this weird, crazy journey with you guys. Yesterday I flew home from Salt Lake City after spending a few days with a handful of boss bloggers at a retreat where we shared our hearts with each other in a really sweet and vulnerable way. Also noteworthy was both the quality and the quantity of world-rocking food that we ate for basically three days straight. So yes, I’m in full blown marshmallow state. When Bjork picked me up from the airport, I said: take me straight to the grocery store. Actually, that’s a lie: I said, take me straight to Panera because I’m craving chicken wild rice soup and that mediterranean veggie sandwich and I am going to become a hangry monster in about three seconds. But after we took care of that imminent disaster, we went to the store, stocked up on food for the week like responsible people, and settled in at home in sweats and hoodies to make pumpkin cake, ancho turkey chili, and healthy meal prep stuffs for the week ahead. We lit a little candle and opened the window cause small kitchens be gettin hot, yo. It was like fall meets Pinterest meets real life, and it was lovely. I cannot even tell you how awesome-and-in-charge-of-my-life I feel right now. A full fridge of flavor-packed healthy food never ever felt so good. One of the bloggers who was at the retreat with me this weekend was the ever-amazing Gina from Skinnytaste. She needs absolutely zero introduction. She is a food blogging legend and a total babe and a two-time NEW YORK TIMES BEST-SELLER as of a few days ago. But here’s the thing you might not know about Gina – she’s literally one of the most kind and positive people I’ve ever met. I want to be her when I grow up. 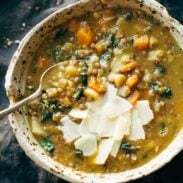 So it totally makes sense that her new cookbook, called Fast and Slow (affiliate link), is loaded with awesome recipes for real people. Sorry to dork out for a second, but you guys, can we just give it up for the cookbooks that work for real people? THANK YOU, UNIVERSE. Gina’s cookbook is 100% for US. It’s not a high-brow food diva situation. No, no. It’s familiar and easy and healthy. It’s called Fast and Slow because half of the recipes are speedy-fast and the other half are slow-cooker-friendly. I’ve only ever made a braised beef ragu one other time (which I love love loved) but I served mine over polenta, so this time around, serving it with pappardelle was bomb.com for a quick and easy melt-in-your-mouth pasta dinner. We are nothing if not pasta people, so obviously. Just, obviously. 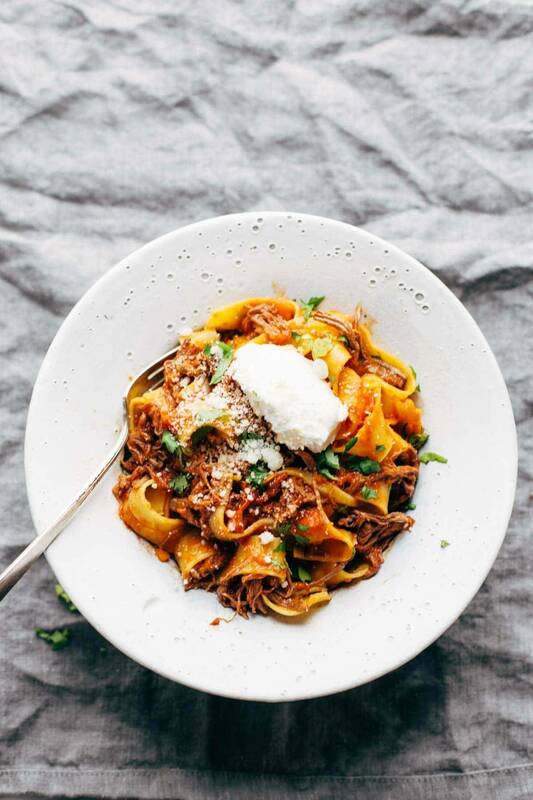 Slow Cooker Beef Ragu with Pappardelle – easy comfort food from the new Skinnytaste cookbook! Season the beef with 1 teaspoon salt and pepper to taste. Transfer to a 5- to 6-quart slow cooker. Pour the tomatoes and broth over the beef and add the garlic from step one, carrots, bay leaves, and thyme. Divide among 8 bowls and top each with Parmesan, ricotta, and parsley. Serve hot! 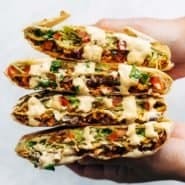 This recipe comes from the brand new Skinnytaste cookbook, Fast and Slow (affiliate link). Instant Pot Instructions: We followed the recipe as-is for 45 minutes on Manual and it turned out great. A quick release should work, but if it splatters, feel free to do a natural release. Is this missing a step? What do you with the garlic and oil from Step 1? Do you cook the beef in it before transferring to the crock pot (Step 2)? Or do you just put the oil & garlic into the crockpot?? Not missing a step, you add it to the slow cooker with the beef and vegetables. Yep, just put it in the crockpot! Thanks Rhian! Glad to hear that! Hi Lindsay! Would it be accurate to use half of all the ingredients if I’m only cooking for 2? What should the cooking time be? Thanks! You can half it and have leftovers! You can make half and have the leftovers the next day. Loving this right now! I’ve got a shoulder of lamb that will be getting this treatment tomorrow… with my brand new slow cooker! What a way to break it in! Thanks. This sounds like my kind of cookbook! I’ve been on bed rest for the last month with no end in sight, so slow cooker meals have been a lifesaver. 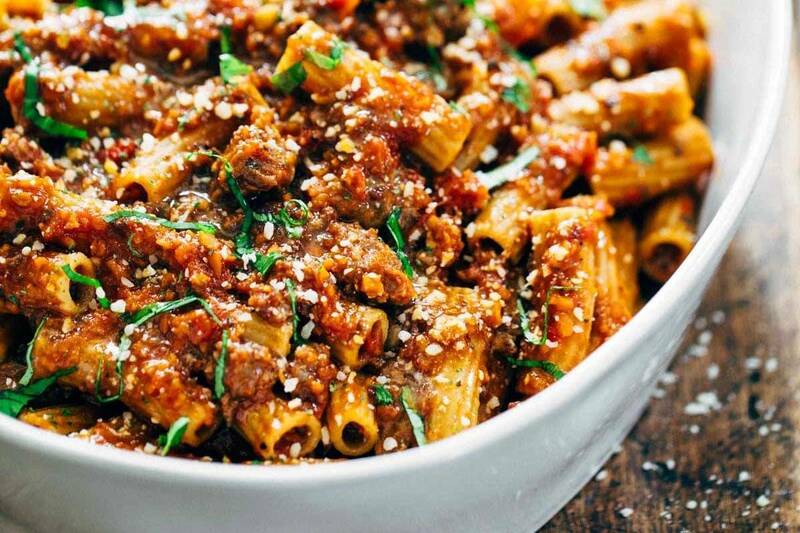 Beef ragu is a fav comfort meal here for sure. I prepared this exactly as written and was …disappointed. I thought it was lacking flavor. I keep looking back through the ingredients and steps to make sure I didn’t miss anything. Oh well, this one wasn’t for us. On to the next! Oh my gosh, I hope you can back to it soon Jill! Lindsay, you’re the sweetest!! I want to be YOU when I grow up and learn how to write like you!! Thank you for your kind review and it was so nice seeing you this weekend! 1. this looks amazing & can’t wait to try it. 2. i am obsessed with that bowl, lindsay!! was it made by bjork’s dad?? I know, right? Bjork’s dad didn’t make this one! It’s from Speck and Stone. You can look her up on Instagram or her website. She is extremely talented! OH MY GOODNESS. 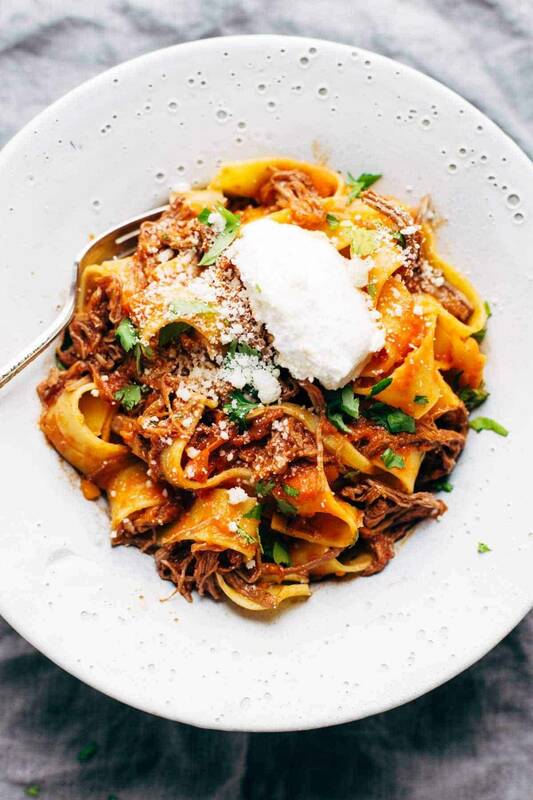 I love shredded beef almost as much as I love pappardelle! Putting this on the menu this week, thanks for posting! Thanks Rachel! Hope you like it! This looks amazing! Totally looks like something Rachael Ray would whip out! 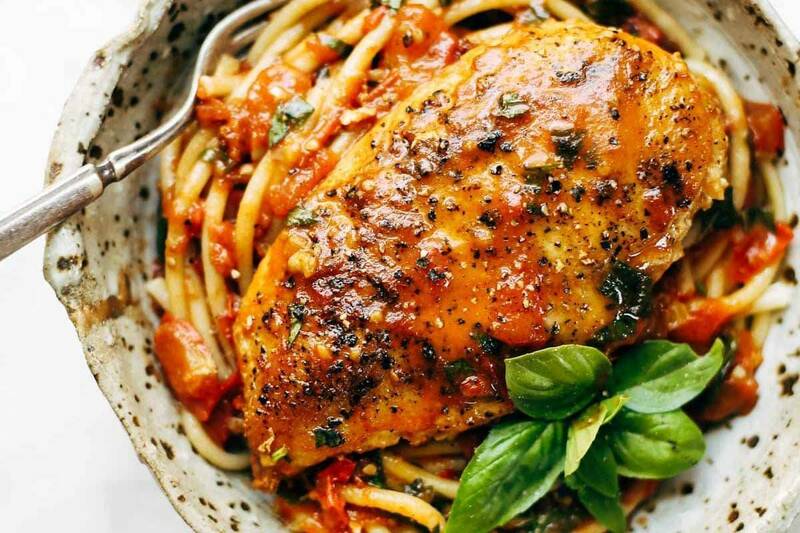 This dish looks simply amazing. The perfect comfort food needed for a Monday. Can’t wait to give it a try! I’m making it right now but we eat gluten free so will serve on zucchini noodles! It is really frustrating as a fellow reader to have ppl “rate” the recipe with stars when they haven’t tried it yet. If you “can’t wait to try” it / haven’t made it yet please don’t rate. When I look at the “stats” of what the average rating is to help decide if I want to make a recipe, posts like yours mess it up. Thank you for saying this! Just post after you’ve made it! Hi! How well does the sauce freeze/last in the fridge? This sounds delicious! Hmmm we’d give the fridge about a week, and the freezer up to six months! Lindsay and Gina I can’t tell you how much my boyfriend and I loved this! Delicious and perfect in the cockpot when one of you has a last minute meeting (w, me) And the other works over night (him) next I want to try it with the polenta! I can’t wait to try this recipe. 6 hours is quite long and I can’t stay home all-day for some errands. Would it be okay to use a pressure cooker to cook the beef? The combination of beef and pasta is really awesome. I hope I can cook this perfectly. Thanks for sharing. Hi Sarah! This bowl is from Speck and Stone. She’s amazing! I made this tonight, and it was delicious! My husband loved it too! Can’t wait to try! Could I use short rib instead of flank steak? If so, would everything including cook time remain the same? We think so! We’ve never tried it, but think cook time should be about the same. Short ribs would need the same amount of time, and actually pork ribs for that long would be excellent, too. You could just pick the bones out by the times end. Yum! REALLY, really good and so easy! My whole family enjoyed this and THAT is so rare!! The perfect quick, easy and cheap dish! However, I ended up pairing my meat mixture with mashed potatoes rather then pasta. 10 out of 10 dish. I made this yesterday and love it! I amended the recipe a little bit b/c I needed to use up some items in my fridge and pantry. I cooked it on high for 4 hours in my slow cooker and it came out perfectly. Thanks again for another awesome recipe!! Congrats on the baby! Just made this recipe yesterday. Turned out rich and delicious 🙂 Thanks for the great recipe! I made it at lunch yesterday and the family loved it. Simple and easy to do!